Over a period of time, I have listened to a lot of Badaga singers [some were as good as professionals] but the best in my opinion is KERBEN BELLA GOWDER who had a golden voice. I met him for the first time all most three decades ago. He could play harmonium, bull bull tara or ‘thambutte’ [drum] with equal elan, His greatest ability was to compose and render songs on the spot, some times suitably changing the verses to suit the occassion.He was a much sought after singer in any function, be it a wedding, savu or anniversary. Just with a couple of his colleagues accompanying on the thambutte [mathalam] and jalra [cymbals], he would sing while playing the harmonium. Sadly, no songs were recorded in any studio. His savu [sad] songs would bring tears streaming down even in the hardest of hearts.Another, great contribution of Bella Gowder is his rendering of many Badaga Ballads – the best being ” BERADA BELLIE “ I had the great fortune of recording [on a tape recorder] some of his songs when he had visited my home at Hubbathalai on a few occassions. Luckily I could trace them recently.It is with a great sense of honour and as a tribute to this gifted singer I have uploaded some of his BERADA BELLIE as well as KAARA CHENNE and other songs on the net so that all of us can listen to his golden voice. The voice quality of some of these streaming songs may not be good due to the original recording having been done on a tape recorder. I bow my head in dedication to Kerben Bella Gowder who passed away a few years back. I have heard a lot about Thangaadu L.Krishnan, probably a contemporary of Kerban Bella Gowder, but only now had the opportunity to listen to his songs, courtesy Priyaraghava of Eddakkaadu. To say the least, the voice of L.Krishnan, is very unique and the more you listen to his songs, the more you want to listen. Simply great. One of the songs from the album, Priyaraghava has hosted in Cooltoad, is “Kundha Paala Roadu dhoge”…the original Badaga atta song. I remember listening to this dance number fifty years back, a song which was a must in any habba. Old timers will remember this song being referred to as ‘ Baby powder’a bekku endhagha, Bella na hennu en Janagi, Akka akka huttidha awai, ondhu jolia heghine baali’. The more I listen to the dance song ‘Kappu Huttileyu’, the more fascinated I become. All the 12 Badaga months starting with KOODALU, [the names of the months given in the page ‘badaga language’], are beautifully integrated within the song. Really, I respect Badaga’s culture. Its great. I never saw such a culture any where. Recently I went to Ooty Flower show and for the first time, I saw Badagas,their culture and their behavior; really I enjoyed.I love Badagas. I am a software engineer…Yo know one thing uncle not only me even my colleagues who don’t know our language also used to hear our songs.They say like they feel very relaxed and energetic when they hear our music…I feel very proud when they praise about our songs and music.. I wish that our community should grow more and more. WE THE BADUGA’S ALWAYS ROCK IN ALL FIELDS GUYS, AND OUR SONG IS AMAZING AND ROCKING EVERY WHERE THANKS FOR “HETHAI AMMA” FOR BLESSING US. I love my community…I proud to say I’m also one of the Baduga ; always baduga rox…. 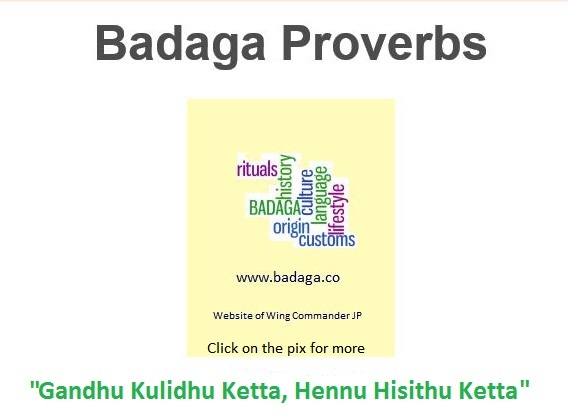 Be proud to be a badaga…………..
nobody is as helpful as badagas…………….. There is a Badaga in all the fields in the world…. so proud to be a Badaga…Badaga rocks always…. mamma nanga badagar hembath thoge appara santhoshava hadathe.enthu ninga madithe he olliya vishayaga appara thanks,he website noditha hodane appare santhosha patte.nanga badagar cola ennu ollange thuddathu,ethuga hengala mudatha help kandippa madiniyuo appara santhoshao. Great site for badagas like me who have never had the chance to interact with our own community . I am a student and have lived all my life in Bangalore . Now i feel i’ve missed out on all the fun. I will make sure i am no more deprived of my culture and heritage. REALLY SUPERB. I AM PROUD OF BEING A BADUGA.BADUGAS always rock. WONDERFUL PEOPLE WITH THESE LOVELY SONGS.BE PROUD BADAGAS. I LIKE BLOCKBUSTER BADAGU MELODY SONGS. PROUD TO BE A BADAGA . proud to be a badaga…..
Amazing job…Indeed am proud to be a badaga..
badugas rock…im really proud to be a baduga!! It is a wonderful website. I am very surprised while seeing this website. Very good keep it up. All the best. Below mentioned sites are very helpful for Tamil type and all other doubts and clarification with regard to Computer and computer related service. Thank JP anna for publishing the photo of mine. If it is ok with you and the developers of this site, I will send one link which will be very helpful for writing in TAMIL . Ganjikke kukkeya song to your email. one small request! If possible, Kindly give option to all members, visitors to insert their pic, while put their comments. This will help all members to know each other. Dear JP anna, Thanks for your continuous efforts to make the site very popular among our Badaga community. தங்கள் விருப்பங்களை கூறி சகோதரர் பெள்ளி ஜெயப்ரகாஷ் அண்ணாவையும் நமது படுகு வலைதளத்தையும் வாழ்த்திய அனைத்து சகோதர சகோதரிகளுக்கும் எனது மனமார்ந்த நன்றிகள் பலகோடி. அனைவரும் தங்களால் முடிந்த தகவல்களை அன்னார்க்கு தந்து மேலும் நமது வலைத்தளம் சிறக்க உதவி புரியுமாறு தாழ்மையுடன் கேட்டுகொள்கிறேன் ..
simply superb web site for Badagas…… every one make use of it and just inform to our community members………..
it is a wonderful and amazing site for badagas. how to download our badaga songs? To download Badaga songs, see the links I have given above in reply to other comments. VERY NICE,EXITING WEBSITE. I HAVE NOT YET SEEN THAT PHOTOS.BUT ALL ARE BEYOND MY EXPECTATION…. The website is awesome you guys are doing a good job. I am going visit this website regularly! I am a software engineer moving across the globe..my only pass time is my Badaga songs…I have never missed any of my villages Hethi and dodha habbas…, I love my culture,..I am very proud to be a Badaga ( who offer world’s best hospitality). I really want live for the community and die for the community. It is since a few years the guys from our community came to learn and work in different parts of the world, many are not aware of the culture. This post is to parents, please ask your son/daughter to take part in all the functions (marriage,habba,funeral ) so that they come to know the reasons why we do all these things during festivals,habbas etc. Once a person knows all these things he/she will never go against the culture. My dad used to tell me “where ever you may be in this world, dont miss the habba (festival)”. These words are from my heart,” I want to do something to my COMMUNITY before I depart from this WORLD and I WILL“. Its really great to see a such a wonderful site about Badaga society. I will be more happy if some one starts writing a script for our language. Thanks for your comment.Unfortunately, you have not given your email. Ok, that was to make you visit my other websites including the one on Badaga songs. Alternatively, download the song from this link. Hope you got the song, and enjoying to dance along with your friends and students. In case of any difficulty in downloading pl feel free to contact me, I will email it to you. sir, I tried what you said in this comment. But I could not find the dance numbers. And I feel some difficulty to search and download the words what you mention. Will be thankful if you send the mele keriyogae song to my email id dharusvs@gmail.com. I am presently in Jordan. I am proud to be badaga because of love and lovable community. I am married and living with daughter and son. Every year I am going to celebrate our beloved hethai habba. In Jordan I am the only person of our community. To see this type of information in internet in non badaga area helped me to feel like our native place. Congratulation to all. If anybody wants to share your feelings and words please contact me.Wish all you a happy new year! JP adds -That is wonderful. I am really happy that people from all over the world visit our site. Wishing you and your family a Happy New Year ! I FEEL VERY PROUD BECAUSE I BELONG THIS COMMUNITY. In this site we can find out all about our people and great leaders. i would suggest one thng here to improve the information…how can i down load the new songs from the website? Going through the site i felt sizzled. Staying far and yet connected. I am happy to go through the website, thanks to all the members involved. Fantastic job done. i like baduga song which is melody. i am proud to say i am a baduga. I am searching for badaga songs in web site. I respect our culture. Its great. I can’t find similar culture any where else in this world. One day I met one person in Ethiopia in addis ababa. He asked me about our Hethai amman . I am really lucky b/c I am born as a badaga. I need to listen to our hethai amman song, If its possible please send me some songs, other wise send me web site for down loading. It is always a pleasure to receive appreciative comments from non Badagas…that too , from those living abroad and know about Badagas. Thank you very much, Abdul Niyas. I was exited seeing this site,My name is abdul niyas and my native is coonoor ; at present i am working in saudi ,all my friends here love baduga songs,I ad Mr. prakash in yedapally were the first one to open the baduga TV program in CTN coonoor, edited in my Nilgiri Digital studio, I love the comunity, congradulations to all members who had made this excellent site.. I was a little surprised that the weblog – wordpress- forwarded to me the ‘exact’ words as comments from Hari, Karthik and Prithima. I have edited the comments of the later two. Karthik & Prithima —…Please let me know if you had sent the same – similar comments…so that I can make corrections if required. Really a lovely website because I am being a Badaga came to know a lot about our community. If possible insert some information or images of Jackanarai village (kothagiri). Songs are wonderful. One word to express the thought is: Great! JP sir, I have no words to appreciate you. Really this is a big effort that you have taken. All the songs and vedios arevery nice. Will you please send “MOGANODI MATHADI THINGUVA KANAKATHUNE ” song to my mail because I like that song very much, but I dont know from where I can down load that song.It is not available in net please send that song to my mail. I am very proud to being a baduga. HETTAI AMMAN THUNAI. I really appreciate you, this website has impressed me, this is really wonderful thought. I like Baduga songs very much. How can I download more baduga songs? How can I download these songs. My mail has restrictions of 1MB only. JP adds : Due to copyright issues, most of the email providers do not permit mp3 songs being sent/received. But there are ways to download directly through the browser (Firefox is the best in my opinion). I have sent you an email. Enjoy! i cann’t download kerben belli gowder songs……. JP replies : Done, friend. Check your email. THIS SITE HAS TAKEN OUR COMMUNITY TO THE WORLD. ONE SUGGESTION I HAVE FOR THE DEVELOPMENT OF THIS SITE -PLEASE CHOOSE FONT COLOR AND SIZE SO THAT IT IS PLEASANT TO READ (highlighting is irritating for the eyes). JP adds : Thanks for your comments. Your suggestion about the site – font colour and size including high lighting, is being seriuosly considered and to the extent possible, implemented. I WELCOME YOUR EXTRODINARY CONTRIBUTION AND COLLECTION TO OUR COMMUNITY. HOWEVER, KINDLY MAINTAIN CERTAIN CODE AND INVITE FEEDBACK FROM BADAGA ASSOCIATION. IT IS HIGH TIME WE SHOULD FIND FEW LEADERS FOR OUR COMMUNITY .IT COULD BE YOU ALSO. JP adds : Thank you very much for your comments.It encourages me a lot when I receive letters/comments like yours. As I have always maintained , my website is open to all and I welcome all comments – both positive and negative – and I can proudly tell you that all comments received have been published excepting one from a guy who used filthy language to describe Badagas. JP adds: which songs are you talking about ? 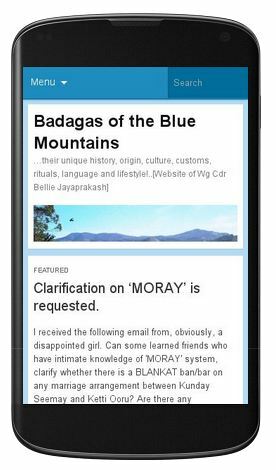 I happened to see the website, which had impressed me a lot from all aspects, you have nicely expressed Badaga’s culture etc.. Great. Keep it up. I found Bugiri in my home.. does anybody know how to play.. I’m very much interested to learn this. It is great to have such sites on badaga culture and customs. Everything is good but the black layout irritates the eyes when viewed for a long time, it would be better if that is changed. JP adds : Thank you, the point on ‘black’ layout is noted. I like baduga songs. Can you tell me the link to download ? All the worthy information provided here should stand forever. There are a lot of information about our great community yet to come on net. I hope it will come soon. I’m proud to be a Baduga and I want many to know more about our culture and our traditions.I wish you could add our traditional marriage [without dowry] and our hospitality. The website impresssed me a lot…expecting a lot more……..Wonderfull…. Really good and neat work. All the worthy information provided here should stand forever. There are a lot of information about our great community yet to come on net. I hope it will come soon. Ninga sevaya thodaruthuga ella devaru singarava, balava tharalindhu vendine…..
638,130 visitors so far! Thank you. Appara Santhosha!